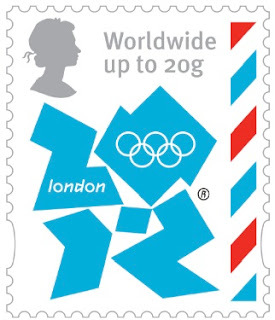 Even before the 'blockbuster' (ie wide public appeal) Roald Dahl literary characters issue at the beginning of January, Royal Mail will issue four Olympic/Paralympic Definitive stamps on 5 January. There will be one each 1st class and 20g Worldwide stamp with the London 2012 Olympic Logo and the Paralympics Logo. The stamps are being printed by Walsall Security Printers in gravure, in self-adhesive booklets. At this stage we don't know whether they will also be in sheets. 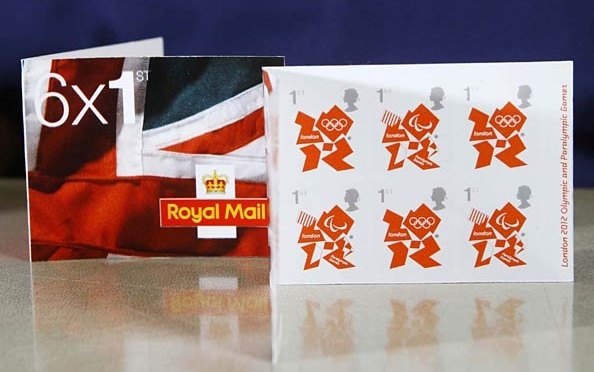 Update: Royal mail have confirmed that the stamps will also be issued in sheets self-adhesive and printed by De La Rue. 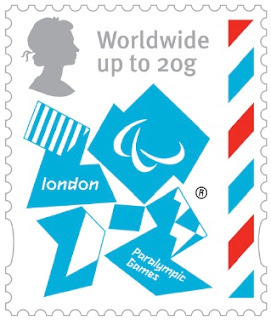 The stamps will be available from all 11,800 Post Office branches across the UK from Thursday 5th January 2012. There are four new stamps - two 1st Class and two for Worldwide use to post items up to 20 gm in weight. Both sets of values feature one stamp with the London 2012 Olympic Games logo and one with London 2012 Paralympic Games logo. 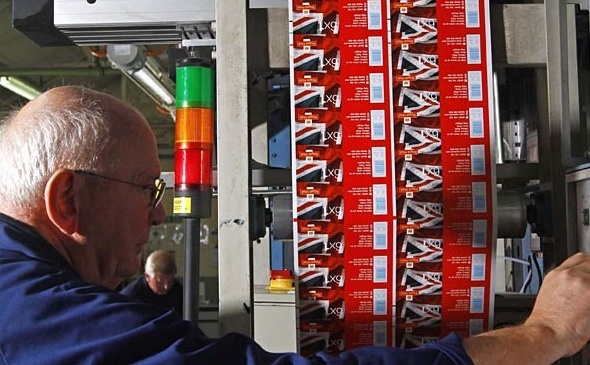 Around a million stamps an hour in striking orange and blue inks will be printed on specialist stamp printing presses in Walsall, West Midlands over the next few days. 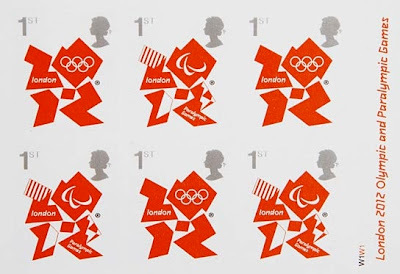 Although appearing red in these images, the stamps will be orange - or maybe the same colour as the 1st class 'flame' that came before the gold, and with which we are so familiar. It also shows that on the web, they appear to be printed only 'two-up'. There's a film of printing and interviews on Stamp Magazine's website. Will these have security codes over the top as per the present first class definitives?? As far as a year code goes I would think it unlikely. 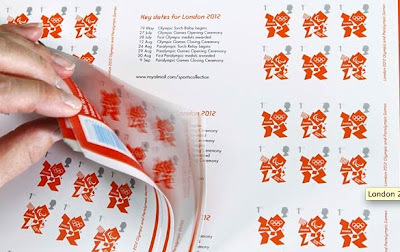 It is possible they would put a code to indicate whether they were sheet or booklet but that may be obvious anyway. My view is that security details on these are unlikely. Security details on the Jubilee definitive are much more likely as they will replace the 1st gold. Wow, great news! 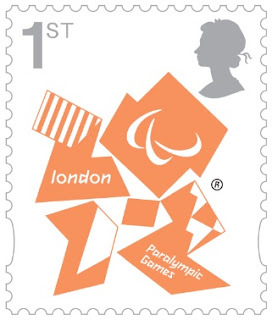 Look forward to adding these to my GB London 2012 collection! So do we have any ideas of the products available? From your article I guess we are looking at 2 x booklets of 6 of the 1st class design, as well as counter sheets for all four designs. (I agree about the security codes, seems unlikely for these "special editions"). Presentation Pack and FDC will be available. 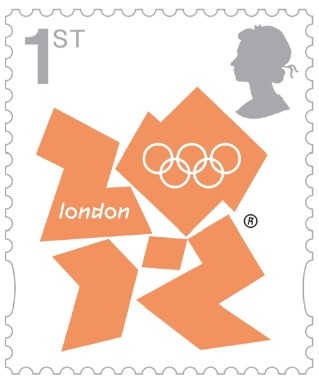 It appears that only the 1st class stamps will be available in - as you say - two booklets. Seems a shame, in view of the visitors - not to have 20g booklets. They are horrid stamps .... if I am offered these by a Post Office official I shall ask for "normal" machins. It wouldn't be so bad, but that logo is dreadful.